Tampa Bay completed their sweep of the three-game series with the Yankees on Sunday afternoon when Jake Bauers hit a walk-off solo home run off Chasen Shreve in the bottom of the 12th inning. Tampa Bay jumped out to a 2-0 lead in the bottom of the first when Matt Duffy and Carlos Gomez each had RBI doubles. The Yankees came right back in the second when Miguel Andujar hit a three-run homer to make it 3-2. Adeiny Hechavarria hit a solo homer for Tampa in the bottom of the second, and they took the lead back in the third when Gomez got an RBI single, followed by a Jesus Sucre two-run double to make it 6-3. The Yankees got two back in the fifth as Didi Gregorius and Giancarlo Stanton each had RBI doubles, and tied it at 6 in the eighth a Stanton solo home run. After Yankee starter Domingo German left after three innings (six runs on nine hits and no walks, two strikeouts), the Yankees bullpen of Adam Warren, Jonathan Holder, David Robertson, Dellin Betances, and Chad Green held Tampa Bay hitless for eight innings. Bauers led off the 12th with the home run off Shreve to end it. The Yankees' Orlando "El Duque" Hernandez and the Mets' Masato Yoshii engaged in a pitchers' duel that kept the game scoreless into the sixth inning. The Mets took the lead in the bottom of the seventh on a Carlos Baerga RBI single. The Yankees came right back in the seventh when Scott Brosius hit a solo home run to tie it at 1. It stayed that way until the ninth when the Mets won it on a Luis Lopez sacrifice fly off Yankees reliever Ramiro Mendoza, which scored Baerga, who led off the inning with a double. Yoshii went seven innings, allowing a run on two hits and four walks, with 10 strikeouts. Dennis Cook came in from the Mets bullpen and pitched two scoreless innings to earn the win, as he did not allow a hit or walk and struck out three. El Duque went eight innings, allowing one run on two hits and five walks, while striking out nine. Mendoza took the loss to fall to 5-2 in 1998. 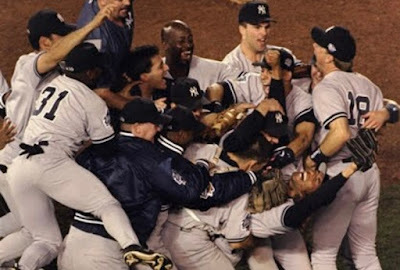 Where they stand: The 2018 Yankees (50-25) remain five games off the pace of the 1998 team, which was 55-20 through 75 games.